If you are looking to start growing cannabis, you may be in a haze trying to figure out which is the most practical light to use on your plants. A single mistake in your decision can have devastating results on your cannabis. However, with the various grow lights in the market, how do you make the right selection? Making the right selection involves having enough information about the different options available in the market and how the different lights they produce can be beneficial to your plants. When looking for Grow Light that is specifically for growing cannabis, you need to get a full cycle LED light. However, you should be aware that you may only have to use it in the vegetative and blooming stages. Other factors you should also take into account include the area of coverage, the type of chips used, the amount of heat produced among other factors. We have made everything simple for you by compiling a list of the best 600W LED grow lights in the market today. Phlizon is an LED light manufacturing company that focuses on developing quality products. The Phlizon Newest 600W LED Plant Grow Light is FCC certified, and UL certified when it comes to product functionality. If you are looking for an LED Grow light can meet the demands of each stage of cannabis growth, this is just what you need. From the seeding stage, to germination and flowering, the Phlizon Grow Light is designed to make your plating efficient and easier. 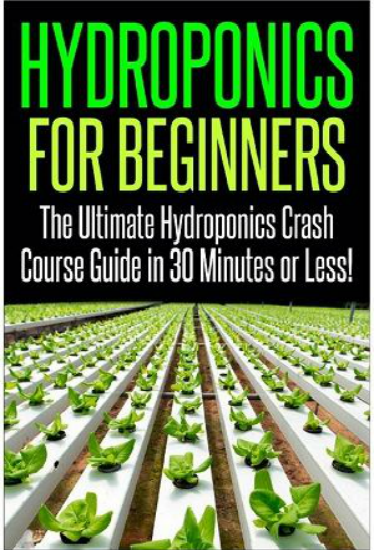 It provides your plants with great coverage promoting high quality yields in your plants. The Phlizon Newest 600W LED Plant Grow Light is designed to provide more value than expected. It produces a full spectrum of light that not only enlightens the garden but also helps the plant to grow through useful light bands that includes UV and IR light. The Phlizon Newest 600W LED Plant Grow Light comes with a BLOOM and VEG switch feature where the VEG tool is for the young seedling in their vegetative growth while the BLOOM switch is used on plants in their flowering or budding stage. 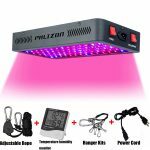 The Phlizon Newest 600W LED Plant Grow Light covers an area of 2 feet by 2 feet when placed at the height of 24 inches above the plants. It comes with an incredible cooling system made of two fans that helps to maintain the temperature of the device as well as prevent any damage to the plants due to the production of too much heat. 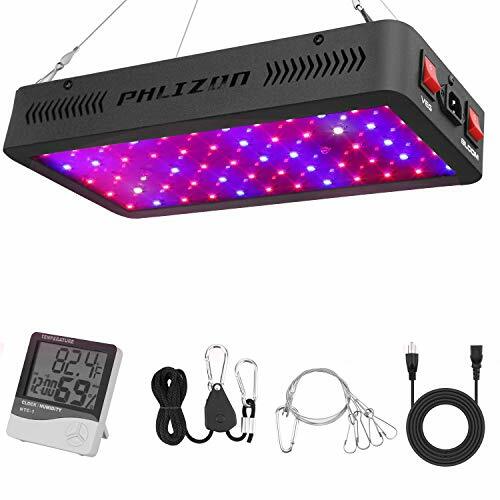 The Phlizon Newest 600W LED Plant Grow Light features a thermometer humility monitor that helps to keep an eye on the changes in temperature and humidity in your growing tent or room. Expect to get excellent service and a two-year warranty together with a 30-day money back guarantee. The BESTVA LED Grow Light is just what you need if you do not have a high budget but want to grow high quality marijuana. The grow light is especially beneficial to large scale growers and professional cannabis growers. You will get a very good coverage area maximizing your cannabis yield. You as well do not have to worry about large electricity bills or continuous maintenance as the light does not spend too much electricity and has a good lifespan. The BESTVA Reflector Series 600W LED Grow Light Full Spectrum weighs about 5.5 pounds and has a dimension of 12.2 inches by 8.2 inches by 2.3 inches. The appliance has two modes for growth; VEG for growing plants and BLOOM for when the plant is still in the seedling stages. The grow light can cover an area of 2 feet by 2.2 feet if placed on a height of 24 inches above the leaves of the cannabis. Once you purchase the BESTVA Reflector Series 600W LED Grow Light, you get a three-year warranty, and 30-day money back guarantee. The full spectrum is efficient to us on all stages of plant growth. It has a sufficient heat management system. It produces an incredibly bright light that may harm the eyes when looked at directly. HIGROW is a respected brand in the grow light market. They came up with the Optica Lens series as competition to the best brands in the market already. The Grow Light is adored by many since it is budget friendly and durable. The Light produced is whiter than a majority of other grow lights in the market but is easily absorbed by the plants eventually leading to increased plant yields. 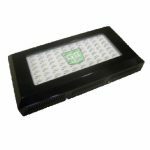 The HIGROW Optical Lens-Series 600W Full Spectrum LED Grow Light comes with two-mode switches that you can switch on and off depending on your plant needs. These are the VEG and BLOOM with the VEG meant for the initial stages of the plant and BLOOM the final stages of the plant. The HIGROW Optical Lens-Series 600W Full Spectrum LED Grow Light is highly efficient as it uses only 250W producing an equivalent light of 600W HPS/MH. The grow light can be used to cover an area of 3 feet by 3feet when placed on a height on 24 inches. The maximum coverage the grow light can sit on is 4 feet by 4 feet. It comes with a highly innovated cooling system made of very silent cooling fans and an upgraded aluminum cooling heat sinks. Once you purchase the HIGROW Optical Lens-Series 600W Full Spectrum LED Grow Light, you will get a three-year warranty as well as a 30-day return guarantee. The VIPARSPECTRA LED grow lights are made to be used indoors for purposes of horticultural plants to medicinal plants such as cannabis. The light spectrum provided by these appliances is customized to increase the yields while maintaining low energy and reducing the cost used in operation when you compare it to traditional methods. 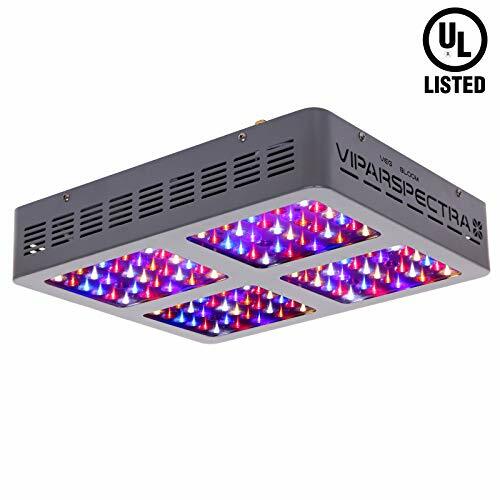 Having lasted for ten years in the market, the VIPARSPECTRA LED grow lights have dominated the market as they are recognized as the most durable. The VIPARSPECTRA LED grow lights are scientifically engineered to balance the PAR output and coverage. It succeeds in mimicking real sunlight due to the full light spectrum that is produced making it usable during all the plant stages. 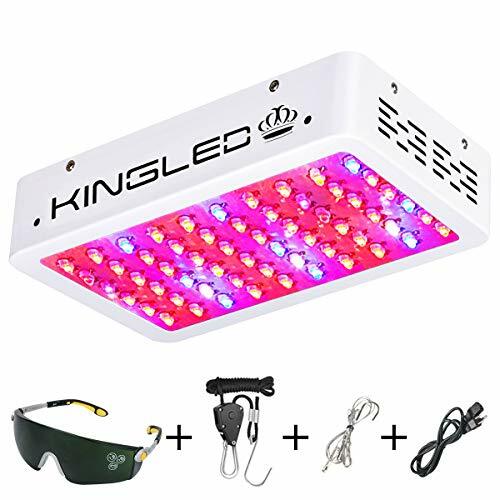 The Marijuana Grow Light comes with 120 pieces of 5W Bridgelux/ EpiLEDs LEDs set at a focusing angle of 90 degrees to help boost plant growth and stability. The Light produces on the plant surface. It is advisable only to allow exposure of 18 hours every day to minimize the risks of damage to the cannabis plant. The Appliance has 5 IR LEDs that may appear to be dim. The LEDs are okay and they help the germination in various stages of growth such as germination, leaf building, and cell division. The VIPARSPECTRA LED grow lights weigh about 9.8 pounds and are about 15 inches to 12.6 inches to 3 inches. It comes with a hanging kit that aid in installation. The grow light can cover an area of 3 feet by 3 feet when placed at the height of 30 inches above the cannabis. It is recommended to have the VIPARSPECTRA LED grow lights at 22 inches high above the cannabis plants during the vegetative phase to cover an area of 2.5 feet by 2.5 feet. The VIPARSPECTRA LED grow lights conserve energy as it uses only 270W and gives off light equivalent to a 600W HPS system. To Ensure that the VIPARSPECTRA LED grow light remain cool, they are equipped with multiple fans and upgraded aluminum sinks. 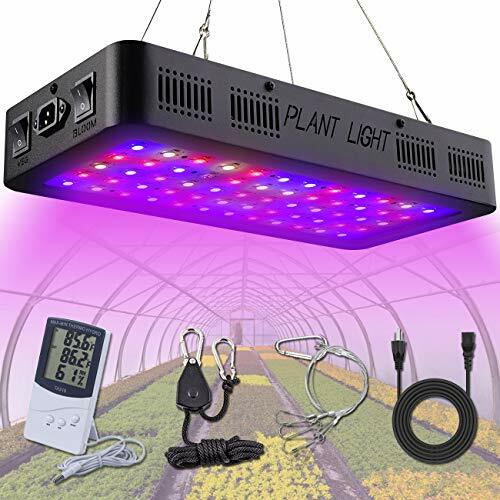 It comes with a daisy chain feature that allows the connection of multiple Grow Lights without worry of the number of sockets available. Once you purchase the VIPARSPECTRA LED grow light, you get a three-year warranty, and 30-day money back guarantee. 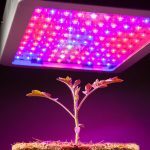 When choosing an Indoor LED grow light, you may want to consider selecting one that can be used by all the plants as well as on all the stages of growth. Such a grow light that fits this bill is the Roleadro LED Grow Light. The Light provided by the Roleadro LED Grow Light not only does it promote indoor plant growth, it as well is crucial in prolonging the flowering stage and making flowers that are of quality. The Roleadro LED Grow Light is a favorite to Amazon buyers with a rating of 4.4 out of 5 stars. It is designed with a reflector cup design that helps to maximize the diffusion of light within a scientific range ensuring high light intensity that is uniform on all the plants hence increasing the light efficiency and reducing on lost light. The Roleadro LED Grow Light produces a complete wavelength of light that is suitable to be used by on all the stages of plant growth. The Roleadro LED Grow Light utilizes aluminum heat sinks to control the amount of heat produced maintaining a cooler temperature even after 24 hours of continuous use. It also utilizes high-quality fans to ensure efficient heat control with minimum noise. It comes with a convenient Daisy chain feature that helps to connect more than one appliance. Once you purchase the Roleadro LED Grow Light, you only get a 12 months warranty, and 30-day money back guarantee. It does not come with a timer. For eight years the Growstar has dedicated its time in researching and developing LED grow lights. They came up with the Growstar 600W LED Grow Light that works for plants that grow on the soil as well as plants that grow in water. The Grow Light is an impeccable choice for the middle-term on an average plant. The light is useful in all stages of the plant growth. 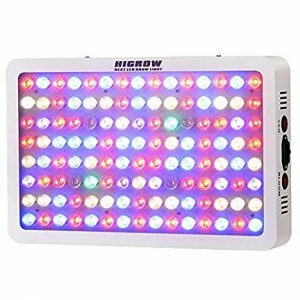 The Growstar 600W LED Grow Light has impressed a majority of Amazon buyers as it has received a rating of 4.4 out of 5 stars on Amazon. The Growstar 600W LED Grow Light is designed to use a 90-degree optical lens to produce high PAR and LUMEN hence leading to a reduction of 40% of the light loss. It produces a full spectrum light that includes both UV and IR that works on all plant types and can be used on multiple stages of growth. The device as well comes with a VEG and BLOOM switch that is important when regulating the kind of light needed for germination as well as for the flowering stage. The Growstar 600W LED Grow Light is maintained cool by use of quiet high-speed fans as well as upgraded aluminum heat sinks. The Growstar 600W LED Grow Light comes with its hanging kits. It covers an area of 3 feet by 3 feet when the Grow Light is suspended 24 inches above the plants. The maximum coverage you can get is 4 feet by 4 feet. Once you purchase the Growstar 600W LED Grow Light, you get a two-year warranty and a 30-day guarantee. 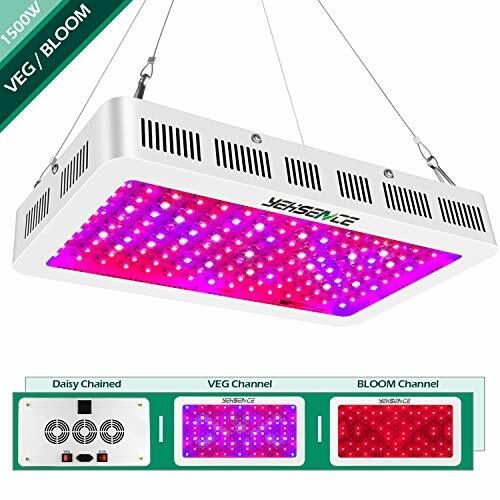 The MEIZHI 600W LED Grow Light utilizes very high quality LED chips to provide light that is very similar to the sun. It uses Epistar LEDs that are considered one of the best in the market. It is one of the best Grow Lights that can help with your indoor cannabis gardening. Considering the amount of light it produces, it is very budget friendly. It is made of a full spectrum and covers a very impressive area. 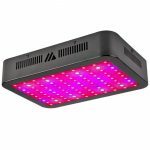 The MEIZHI 600W LED Grow Light has had a significant impact on Amazon with the majority of the buyers leaving great reviews. 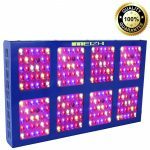 The MEIZHI 600W LED Grow Light blends red, blue and white to get a full-color spectrum and natural lights to all your plants. The light can cover an area of 3 feet by 3 feet when placed at the height of around 18 inches. The MEIZHI 600W LED Grow Light is designed with a reflector that stays at an angle of 120 degrees to concentrate the light beams onto the plants and maximize the efficiency in spreading light all over the plants to ensure a high yield. It comes with a VEG and BLOOM Switch that can be used to adjust the type of light needed for the various stages of plant growth. BLOOMSPECT is a relatively new entry into the market. They launched their Grow Light in 2017. The company is based in Shenzhen, China. It has rapidly become a favorite to many cannabis growers since it is twice more efficient that expensive brands in the market. When compared, it as well does not consume a large amount of electricity. It is just when you need when on a budget and still not wanting to sacrifice the efficiency of light. The BLOOMSPECT 600W LED Grow Light comes packed together with a hanging kit, a 6-foot power cord as well as a user manual. The BLOOMSPECT 600W LED Grow Light uses 120 pieces of LEDs each of them with 5W. It can replace a traditional 600w HPS. It is energy efficient as it consumes only 126W of electricity. 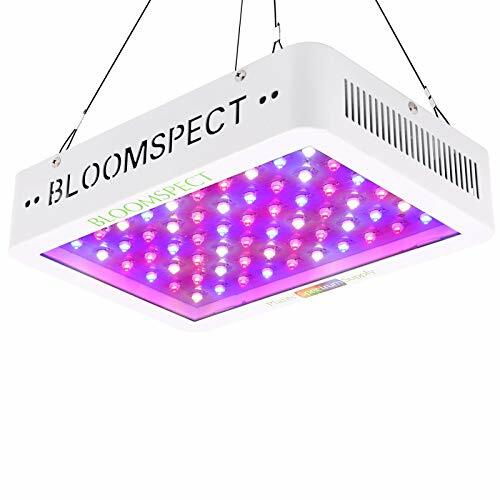 The light that is emitted by the BLOOMSPECT 600W LED Grow Light is well balanced between Blue, red, white and IR hence bringing about efficiency and higher plant yields. It comes with a Daisy chain feature that allows you to connect more than one appliance without the trouble of adding extra sockets. It comes with a two-year warranty as well as a 30-day money back guarantee. The HIGROW 600W Double Chips LED Grow Light is from the same family as the HIGROW 600W Optica Lens, however, it is designed with 60 pieces of super double LED chip of 10 watts. The performance of the Light beat the price tag on it. It as well covers an area very well boosting the growth of your plants. The HIGROW 600W Double Chips LED Grow Light is a favorite to many users as it has a high rating on Amazon. The 60 pieces of 10W super bright LEDs have a higher PAR/LUMEN output per watt than the other grow lights in this category. It saves on power by using only 120watts giving out an equivalent of 600 watts. The HIGROW 600W Double Chips LED Grow Light can fit in an area of 3 feet by 3 feet when suspended 24 inches above the leaves of your cannabis plants. The Maximum area it can cover is 3.5 feet by 3.5 feet. You receive a three-year warranty upon purchase and a 30-day return guarantee. The G8LED 600 Watt MEGA LED Grow Light has undergone numerous changes for eight years to become the most innovative indoor growth technology currently. The G8LED has a track record of excellent performance. It maintains the best longevity in the LED category. 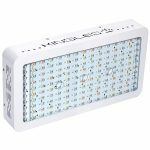 Some bloggers and sites have claimed the G8LED 600 Watt MEGA LED Grow Light to be the best in the market. It is a cheaper and more efficient alternative to traditional lighting sources. The Grow Light runs quietly while helping the plants underneath to be healthier and more vibrant. It has as well won several awards including the 2017&2016 Best LED Grow Light Award by High Times Magazine as well as the appearing on the 2018 Wiki Top Ten #1 LED Grow Light. It utilizes only eight bands of light color giving it a perfect wavelength. The eight color band together with the UV and IR promotes healthy plant yields. You may as well boost the returns by adding on the two 90W Re Flower Boosters in the flowering stage. The G8LED 600 Watt MEGA LED Grow Light is meant to replace the 1000W HPS/MS system. Every Grow light in the market is different and unique in its way. They all offer exceptional performance. However, you have to select the best light that suits your growth needs by considering the budget in play and the area of growth. Regardless of whether you are a new cannabis grower or not, the above listed Grow light appliances will sure be beneficial to you. MEIZHI Reflector-Series 1200W LED Review: A Good Choice or a Waste of Money?